Do you remember studying Abraham Maslow in those early years of college psychology classes? 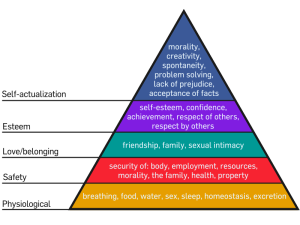 Maslow’s Hierarchy of Needs was a theory proposed in his paper titled “A Theory of Human Motivation”. Maslow’s hierarchy remains a popular framework for understanding human stimulation. It also serves as a cornerstone of understanding the basic psychology for students’ motivation to learn. But it is also crucial in motivating a team of teachers to perform under high stakes. financial security – for instance being able to pay your bills, job security, etc. Positive Organizational Structure: Trust, honesty, and fairness are cornerstones in creating a positive school culture. In addition, there should be a sense of community and a sense of fun! Creating a sense of community can be tough, especially if you are at a large school. Start with Professional Learning Communities, but consider collaboration beyond grade levels where faculty and staff are cross teaming in their collaborative efforts. Vertical teaming is a great way to build professional collaboration and understanding of what other grade levels or departments are responsible for as well as your own. Plan competitions with neighboring schools, maybe a kickball or volleyball event. How about a meet and greet at a local park for your kindergarten students right before school starts? Think of ways to involve all community stakeholders. Include students, faculty, staff, PTA, business partners, etc. Learning can be intense, so make sure there are lots of BRAIN BREAKS during each day for students and plan ahead lots of fun activities. If you are in elementary, allow students to have dress up days. They can dress up like their favorite superhero, teacher, what they want to be when they grow up, the list can go on and on and your students love to play dress up! Try a tricycle race with staff members, it doesn’t matter what age group you are in for this activity, it will surely be a blast! Plan cake walks for teachers with perfect attendance for the month. Your imagination is the only limitation. Clear leadership and expectations: Effective leadership and clearly-defined expectations create an environment where employees know what it means to succeed. This is especially important as teachers are evaluated and lately that means on student test scores. It also leads to high employee morale and organizational trust. Lack of leadership and unclear expectations can increase frustration and stress. As an educational leader you have a moral and ethical obligation to create transparency with high expectations. There should be no guessing games and definitely no playing games with professionals. Evaluations should be clear and transparent. If a teacher or staff member is not performing up to your expectations it is your responsibility to build the capacity of that employee before trying to find them a way out the door. Think about the classroom. You would give your student support with interventions before letting him fail your class, right? How can you as a leader effect change in a way that is collaborative rather than dictator-like? Growth and Development: Employees that are given opportunities to grow and develop their professional and interpersonal skills creates a more committed workforce that performs better in current and future roles. Again, think about how this transfers to the classroom. Students given the opportunity to grow and develop are more motivated to learn and successfully perform. Civility and respect: School cultures that are respectful and considerate foster good teacher and staff morale, low absenteeism, excellent teamwork and high levels of perceived fairness. The result? A culture marked by positivity and widespread job satisfaction. Recognition and Reward: If you have studied Robert Marzano, this should ring true with best practices for students. Schools that are good at recognition and reward know how to appropriately appreciate the efforts of its students AND staff in a timely way. Students, teachers and staff that are recognized and rewarded are more motivated, confident and tend to exceed expectations. Involvement and influence: Employees want to feel that they have a voice at work. When employees are engaged and empowered effectively, the result is higher morale, job satisfaction and a healthier corporate culture. When employees feel like their opinion doesn’t matter or they aren’t permitted to make decisions in areas that should logically be within their authority, stress builds and job satisfaction suffers. Workload management: Environments that consistently overburden staff with an unreasonable workload can cause stress and emotional havoc. However, a challenging yet realistic workload creates job satisfaction and builds confidence. Often in a school, the same teacher leaders end up carrying loads of ancillary duties and responsibilities. Be mindful who your worker bees are and make sure you are acknowledging and recognizing them. Also be mindful of what they are doing and don’t overload them with more than they can proficiently handle. Balance: Employers that recognize the importance of work-life balance and feature flexible policies that respect the demands of the individual’s home life create a happier, less stressed and more productive employment culture. School system leaders including principals have an ethical duty to develop and implement policies and programs that will ensure a psychologically safe workplace. Simply throwing out the buzz word or even talking about a psychologically safe workplace doesn’t make it happen. There must be deliberate action with leaders who are committed to maintaining a healthy/safe workplace. Addressing psychological health and safety is critically important. Thinking deeply about how this affects your school culture begins with leadership. It is a new perspective towards leadership that is rare, but not uncommon. It is rare to find leaders with this type of capacity, yet they exist and more often than not they are leaders that are behind the scenes and often “quiet leaders”. A commitment to Psychological Safety begins with the right leaders. It also begins with planning for a school culture of emotional and social well being. This means as a leader you understand the connection between psychological health and productivity, sustainability, growth and success. In times of rising pressures in education (increased competitiveness, a faster pace and tighter economy), creating an environment where faculty and staff flourish benefits both the overall organization/school and the bottom line, your students! Your school’s capacity to respond effectively to constant change and new ways of doing things will be significantly enhanced if teachers and staff are not hampered by poor psychological coping skills or feeling unsafe in their workplace. To have a successful and TRANSFORMATIVE psychologically safe initiative, efforts will require a distributive commitment, collaboration and conversations amongst faculty and staff. So the question remains: How do I as an educational leader build a psychologically safe school for my teachers, staff and students in this high stakes era of accountability and standards based instruction? Determine a variety of formats to promulgate the PSYCHOLOGICALLY SAFE SCHOOLS AND CLASSROOMS INITIATIVE at your school. Formats of communication may include: whole group, small group, blogs, newsletters,digital calendars, webpages, phone trees, phone tree texts messages and more. Make sure you have a representative team in place to help promote the plan. Remember at the core of psychological safety will be distributive leadership. If you have a team helping get your message across, you will have a better chance for buy in because you have more teacher leaders supporting the initiative. Engaging your faculty and staff will also come in a variety of formats. But remember to honor teachers time and think about how you can reach and engage without it seeming like you are adding something else to their plate.